Matthew Apgar - mapgar@shawmedia.com Lauren VanVlierbergen of Jacobs High School laughs with her father as she poses for a portrait on Tuesday, June 23, 2015 in Algonquin. 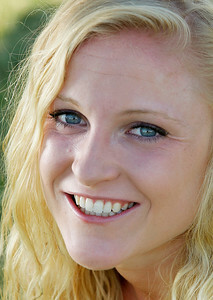 VanVlierbergen was selected as the 2015 girls track and field athlete of the year as well as the overall female athlete of the year. Matthew Apgar - mapgar@shawmedia.com Lauren VanVlierbergen of Jacobs High School poses for a portrait stretching on the grass at her high school on Tuesday, June 23, 2015 in Algonquin. 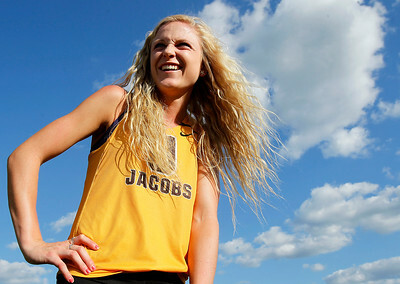 VanVlierbergen was selected as the 2015 girls track and field athlete of the year as well as the overall female athlete of the year. Matthew Apgar - mapgar@shawmedia.com Lauren VanVlierbergen of Jacobs High School poses for a portrait on Tuesday, June 23, 2015 in Algonquin. VanVlierbergen was selected as the 2015 girls track and field athlete of the year as well as the overall female athlete of the year. 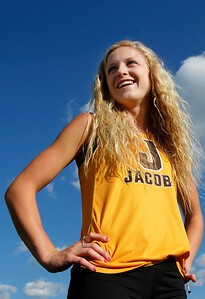 Matthew Apgar - mapgar@shawmedia.com Lauren VanVlierbergen of Jacobs High School leans up against the fence surrounding the locked track at Jacobs High School on Tuesday, June 23, 2015 in Algonquin. VanVlierbergen was selected as the 2015 girls track and field athlete of the year as well as the overall female athlete of the year. Lauren VanVlierbergen of Jacobs High School poses for a portrait on Tuesday, June 23, 2015 in Algonquin. VanVlierbergen was selected as the 2015 girls track and field athlete of the year as well as the overall female athlete of the year.